After giving up grains (even sprouted), I feel so much better! No more CONSTANT hunger and headaches that came from eating high carb foods! I finally feel like I am in control of my health and weight, and it is no longer left to chance! Many people are afraid of coconut flour recipes. I used to be until I started experimenting myself, and now, I love using coconut flour. Did you know recipes that use coconut flour alone are cheaper to prepare than those that call for almond flour?? When using coconut flour, you get a great yield than compared to the same amount (by volume) of almond flour. I had already created a grain-free and low-carb Cinnamon Raisin Bread for my first cookbook, Satisfying Eats. The version in the cookbook is easy and delicious, made with a combo of flax seed meal, almond flour and coconut flour. However, I wanted to create a nut-free and seed-free version. It is SO easy for those of us who have given up grains to over-consume other foods and nuts tends over-eaten by many. Looking for more Nut-Free recipes?? Also be sure to check out my new cookbook, Comforting Eats, for other nut free recipes like Hummingbird Cupcakes, Spice Cookies and Coconut Macaroons. Did you know?? Most recipe that call for almond flour can also be converted to nut-free by using ground up sunflower seeds or pumpkin seeds. This recipe is SUPER easy! Mix the dry, add the wet, blend. Let set 3-4 minutes and blend again, EASY!! I do recommend lining your loaf pan with parchment paper to make sure there is no sticking. I used an 8 X 4 inch loaf pan to get a little more height to the bread but you could use a regular loaf pan as well. Also, make these into muffins, yum! Be sure to use quality ingredients. I use Tropical Traditions or Bob’s Red Mill coconut flour due the brand’s finer texture. Use quality eggs and if you do want to make this bread dairy-free, be sure to use a quality coconut milk like this one or make your own. Pumpkin Spice Bread: Add 1 tsp. (or more) of pumpkin pie spice to batter. Cinnamon Raisin: Add 2 tbsp. (or more) of raisins to batter. Also consider making these into muffin top or scones using a muffin top pan. I have SO many recipes coming up like this yummy Kumquat Marmalade which paired PERFECTLY with the Cinnamon Bread! What other recipes would you like to see on the blog?? Please tell me in the comments below! Also, be sure to Follow Satisfying Eats so that you don’t miss any recipes that I post! My Facebook page is quickly approaching 10,000 followers so get ready for a BIG giveaway! Again, thanks so much for all of your support! Preheat oven to 350 degrees F. Oil loaf and line the bottom of the pan with parchment paper. Blend dry ingredients with whisk until well blended. Add remaining ingredients and blend well. Taste for sweetness and adjust if needed. Let stand 3 minutes and then blend again. Spread batter into prepared loaf pan. Bake for 25-30 minutes or until toothpick inserted into the center comes out clean. Cool on wire rack. Store in refrigerator. *If using a natural sweetener, add 2 tbsp. of raw honey or coconut sugar to batter. Taste for sweetness and adjust if needed. 90 Calories, 7 grams of Fat, 2 Net Carbs, 3 grams Protein per slice. I hope you have enjoyed this blog post. If you love my site and have enjoyed all of my recipes and content, please consider supporting me through my affiliate links. This is at NO cost to you. I simply receive a VERY small commission on purchases made through links on my site or by using THIS link through Amazon. celiac disease I would love a recipe for wheat free “pop tarts”. I so enjoy reading your blog. It has helped me tremendously. Thank you!!! Veronica, I hope they enjoy the recipe! Glad you enjoyed the bread Nina! Kudos for the low calorie recipe too!! Looking forward to trying this. Typically, coconut flour recipes are lower in calories for those of us who unfortunately have to moderately track them. My doctor told me on Monday that I need to eliminate gluten, dairy, corn and chocolate. A friend sent me a link to your site, and I looked at some of your recipes. Are there any you can think of that fit these parameters? I liked a couple, but they had sour cream, cream cheese, etc. Tami, for most recipes, coconut milk can be substituted for the dairy products. But for cream cheese (like in the cheesecake), this would not work. Duh. . . I just saw the notes about dairy free! I had time to make this morning before I went to work. When I got home… not a crumb left!! Need I say more! Thank you Melissa!! Made this today – my first time making a grain free bread. Super easy to make. It came out light and airy. Good to eat alone but delicious with some grass fed butter. I doubled the cinnamon because I love cinnamon – might even triple it next time. The house smells heavenly. Probably a dumb question, but do you melt the butter? Candy no, for this recipe, you want it cold (I even emphasis it in the instructions). If it is melted, the dough will be sticky and not want to roll up. Reread instructions because this recipe is very specific about keeping everything cold. Hope this helps! Hrm, I don’t see anything in the instructions about keeping butter cold. I actually melted mine and it turned out great. Did you mean for the cinnamon rolls? Sorry, yes, I thought I was answering a question about the cinnamon rolls! 😉 Yes, melted butter for the Cinnamon Bread. Melissa, I love all your recipes I’ve already tried! Thank you!!! It would be helpful to include the size of the pan to bake this bread in. This looks delicious! Unfortunately, on top of wheat and dairy, I also can’t eat eggs – do you think this recipe would work with applesauce, flax-eggs, or some other egg replacer? Thank you! Roni, I am not skilled yet in substituting out for the eggs. It’s on my to-do list! Vivian, you can use any dairy or milk in the same quantity as the recipe calls for. The same thing goes for using coconut oil instead of butter. I hope you enjoy! Can’t wait to try this, I eat low-carb and am trying to convince my hubby to join me. He misses bread so bad, hopefully this will help him in the mornings. Can you tell us what the consistency of the dough should be like while mixing and after baking? I have the hardest time making bread like products from coconut flour. After it is baked, the dough is always very soft (uncooked like) and never comes out great. Any thoughts? Lisa, I think the key to baking with coconut is to make sure it is fully hydrated. This is why I wait a few minutes and give it the extra mix at the end. Have you tried this recipe?? Did you do that?? I hope this helps! I know this is late, but wanted to tell you what I did. I made it using your recipe, but cooked it in mini muffin tins for 12 minutes, then cooled the muffins. Added cream cheese sweetened with cinnamon stevia for frosting. Yum!! A big hit with my teenager, who can really eat. Thanks so much for a great recipe. I made this today. I used the muffin top pan. It made 10 muffin tops. Because I had let myself run out of butter. I used unsweetened applesauce. They turned out great. Thank you so much for all your recipes. I posted a link to your site on Calorie Count. Tamara, What did you use the applesauce I place of for this recipe? Can’t wait to try this recipe!! Where on your blog can I find info on your spiral bound cookbooks, I.e. cost & ordering. Love your recipes! Patti, here is the link: https://satisfyingeats.com/order-cookbooks/ glad you are enjoying my recipes! Hi Thank you for sharing this recipe! I am looking forward to trying it out. I am also wondering what nutrition calculator you use. I am trying to find a good one and have had no luck so far! Oh..my..word…I added 1/2 tbs maple extract and a tbs of nutmeg along with the cinnamon and made this into 12 mini muffins (baked for about 18 min), put on some Kerrygold butter while still warm. So so so good. A lot of recipes mix almond flour w/the coconut, but it always turns meal-y to me, just using the coconut flour is amazing..light, fluffy and delish. 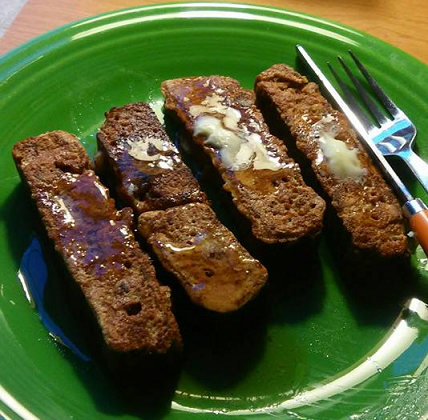 Made this on Sunday, my first time making a low-carb bread. LOVE the texture! I used a few slices to make french toast this morning, and that worked out great! Made this yesterday just for fun, it turned out great. Pair it with some Kerrygold butter and you have a delicious snack with your morning cup of coffee! Please offer cheesecake recipes that do not use a special pot appliance. Thank you.